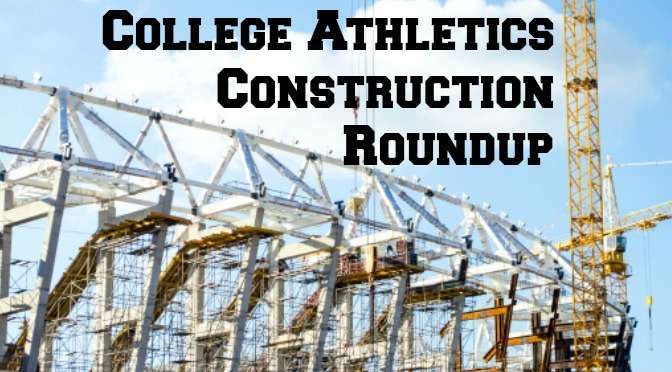 The “College Athletics Construction Roundup” is a monthly series on the construction of intercollegiate athletics facilities. Each month we’ll provide a list of announced, in progress and recently completed athletic construction projects from around the country. You can view previous editions of the “College Athletics Construction Roundup” here. Minnesota has cleared the way for its $166 million Athletes Village. The school will build a new competitive track facility on the main campus to mitigate pervious Title IX concerns over the Athletes Village project. Penn State unveiled its facilities master plan. In addition to necessary seat back and plumbing renovations to Beaver Stadium, another facility marked for renovations is Jeffrey Field. The soccer complex is in need of permanent restroom facilities and home & away locker room facilities. Abilene Christian unveiled plans for a new on-campus football stadium. The 12,000 capacity stadium will include berm, club level and suite seating. The stadium will feature an HD video board. Future expansion plans include a south end zone complex to house all football operations and sports medicine facilities. Purdue is planning a new football performance complex. The $60 million, 110,000 square-foot facility will be built adjacent to the Mollenkopf Athletic Center. The every-day home for the football program will include a locker room, meeting rooms, players’ lounge, sports medicine and performance training areas and office spaces. USC revealed plans for a $270 million renovation to the Los Angeles Memorial Coliseum. Upgrades include replacing every seat in the stadium, a new south side building for the press box and club seating, new stadium lighting and updated Wi-Fi technology. Oklahoma will install a new video scoreboard in Gaylord Family-Memorial Stadium. The project will remain within a $5 million budget and is expected to be the second largest in the country, second only to Auburn. Utah opened its new Huntsman Basketball Facility. Construction on the 101,000 square-foot, four-floor facility began in May 2014. The facility includes practice courts, player lounges and locker rooms, offices, recruiting lounges and meeting space. Davidson will dedicate the new Harry L. Vance Athletic Center. The 50,000 square-foot facility provides two practice courts for the basketball and volleyball programs. Locker rooms, office space and film rooms are also included in the facility. Michigan State will spend $50 million to renovate the Breslin Center. The two-phase project will expand the concourse and restrooms and a new Hall of History: a 26,000 square foot wing celebrating the history of Michigan State basketball. Houston baseball unveiled plans for a new Player Development Center. The 20,645 square-foot facility will be located along the third base line of Cougar Field. Amenities include batting cages, a new clubhouse, training room and hot / cold tubs and a fueling station. Nicholls State broke ground on a $5 million renovation project to Ray E. Didier Field. The two-phase project will include a modernized press box, concession stand, field lighting, a field house for offices and a locker room and enclosed batting cages. Baylor announced plans for a golf practice facility. The 14-acre site will be located next to the equestrian center and will feature a driving range, clubhouse and practice course. Auburn will add over 800 seats to its softball stadium. With the additions, capacity at Jane B. Moore Field will be close to 2,500. Additional restrooms and concessions to handle the increased capacity will also be included in the project. Louisiana Tech will replace the playing surfaces at both the baseball and softball facilities. The project will cost $1.2 million and should be complete in time for the upcoming spring seasons. Oral Roberts broke ground on a new outdoor track facility. The facility will be the first outdoor track facility in the school’s history. Ohio State will build a new multi-sport arena, set to open in 2018. The $30 million facility will host competitions for several sports: volleyball, gymnastics, fencing and wrestling programs. UC San Diego opened the Alex G. Spanos Athletic Performance Center. The $4.3 million space features strength and conditioning and athletic training zones, an outdoor conditioning plaza and conference room. The New York Times reported the next Arms Race in collegiate sports is directed at how schools provide meals for their athletes. In addition to expanding budgets for food and beverages provided to their student-athletes, many schools are building fueling stations in existing facilities and building entirely new athletic dining facilities. Have a project you’d like to submit for next month? Email us here.